Welcome to our handbook for US Presidential Election coverage. Below you will find suggestions and examples of how ScribbleLive users have followed the current US Election (and other elections) so far. It's going to be a long final week for you and your users, so make sure you have the right content and coverage to keep your audience engaged and informed. If you have any questions, please do not hesitate to reach out to your Customer Success Manager. From November 1-15, all ScribbleLive customers will be able to syndicate live polls (in English-only) straight into their streams or website – free of charge. Opinary makes opinions matter. 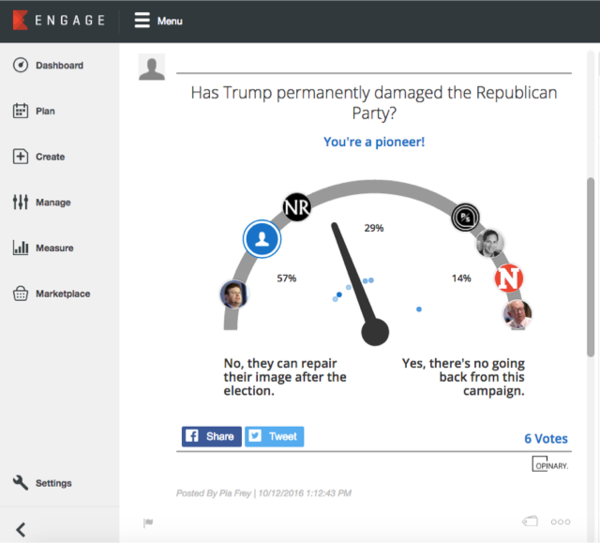 Opinary's interactive technology lets users understand a debate at a glance and voice their opinion with a single click. Embedded within seconds, Opinary's storytelling tools create 200x increased engagement for leading global publishers from Bild to The Guardian, and brands from MasterCard to Siemens. Opinary is the real-time hub for insights and opinion. 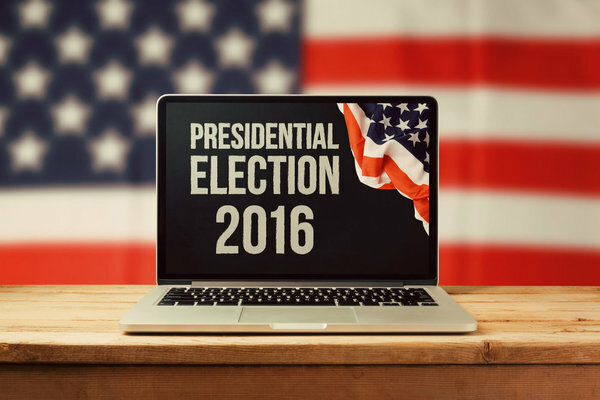 ScribbleLive's unique syndication technology enables you to access the latest Opinary polls around the US Election directly from the Search Hub in the ScribbleLive backend. 4. Opinary will create one to three polls per day, and the polls will show up automatically in your raw feed as they get published. Once this is done, you can go into any stream and select your Opinary feed via the Scribble button in the right handrail to make your audience's sentiments part of your election coverage. You can also re-use an Opinary poll anywhere on your website. We call these single posts Content Atoms: Simply grab the post's embed code and paste it into the article of choice in your CMS. Over the past few months, many of you have reached out wanting to discuss ideas on how to best cover the election. We'd like to share some real-life examples of ScribbleLive clients using the product for exceptional election coverage. Canada's public broadcasting network has been using a fantastic API implementation to adjust content to users' reading habits and interests. The stream is based on our Key Events logic (left-hand side) that summarizes the crucial moments of an event – the included example is the first debate of this election cycle. With a click, readers can quickly navigate to those posts in the stream that they are particularly interested in. ScribbleLive had already been part of CBC's 2015 Election Center for Canada’s federal election as a discussion tool. French speaking Belgium's public broadcaster RTBF sent three reporters on three different routes through the United States. With nothing but a smartphone as a reporting tool, they tried to learn and document as much as they could about US history, society, people's hopes, fears and thoughts on the candidates. News agency Reuters decided early on to create a single go-to-page for all updates on the presidential election. Over one year and 200 (!) Scribble pages later, we still don't know who will be the next US President – but we do have proof that this has been a very newsworthy campaign year indeed. La Repubblica is collecting tweets from their reporter network within the US in five different languages. You can also add this to your sources as a raw feed by syndicating their "Europe goes US" stream from the ScribbleMarket for free. The election cycle may be coming to a close on November 8th, but for your newsroom, this day and its aftermath mean some of the most stressful and busiest moments of 2016. It is not just important that you use ScribbleLive for your election coverage – it is important to us that you use it right and effectively. Many colleagues that will support you during your peak election coverage might not be familiar with the ScribbleLive platform. Below is a summary of basic tips and tricks that you can distribute amongst your team. Some of them will create an easier workflow for your reporters, some are useful to structure content for your audience. Most of you know how to setup a stream, but there are some useful tweaks you may have forgotten. Posts via Email: If you have reporters on-site and wifi is weak, they can still send in posts via email as an alternative to using the App. Guest writers: If you have invited special commentators to add their predictions, comments or analysis to your coverage, you can limit their access to a particular stream by sending them access as a guest writer. NOTE: Some organizations have firewalls which will not allow access to ScribbleLive. Be sure to have your guest writers check accessibility well before coverage date. Icons are a good way to highlight certain posts without pinning them to the top of your stream. For example, you could create icons for the key/swing states to clarify which state a result is flowing in from. You can also create icons for Clinton/Trump to mark updates from a political camp, as well as create icons for your reporters' locations. You can write posts without publishing them right away. Maybe you already know what you want to say, but are just waiting for confirmation from an on-site reporter or a certain percentage number from the polls to hit ‘publish’. Simply press the "+" instead of "publish" and it saves your post in the Moderation Hub. If you need to access, use posts in various streams or have a lot of automated content – the best way to navigate is by creating an unpublished raw feed. Using the editor seems easy, and it is. However, there are small things you can easily forget when you are in a hurry, but some of these forgotten features can help make your content more visually digestible and appealing to the reader. Links: Imagine your stream as your user's topical landing page from which you can direct them to other sources or articles on your website. Have your colleagues written an analysis piece while you've been running your coverage? Link to it! Content Studio now renders a preview before the post gets published. 3rd Party Content: Remember that ANYTHING that has an iframe code can be published in ScribbleLive. For example: If you use live stats – like Yahoo did – or a customized map, just drop the iframe code into the text editor and publish. Facebook LIVE + Periscope Videos: Simply copy & paste the embed code into ScribbleLive to include live coverage into your stream. HINT: Pin your content to the top of your stream so that it is front and center. Styling Options: It's one small step for you but a giant step for your audience. No one feels naturally drawn to a long chunk of gray text. Highlight keywords, make them stand out, use the quotations button for important citations and statements. Follow Twitter Lists: If you have already created a Twitter list with all relevant sources on Twitter itself, you can follow all members of this list in one go by adding that list to your automation filters. Just beware that the number of accounts on your list cannot exceed your auto-follow limit. Automate into the Moderation Hub: If you want to keep an eye on a selected number of Twitter and Instagram accounts (or keywords), you can automate each of those directly into the Moderation Hub (and filter your search from there). RSS Feeds: Do not underestimate the power of RSS feeds, they can easily enhance your election coverage by gathering relevant news articles – and they can look good. Tags: You can assign one or more tags to each post type. This is meant to help your workflow when you are working with several other people. For example, tags could be names of your colleagues who you assign posts to, but it can also be a topic- or state-related tag– "Voter interviews" or "Florida" for example. Make sure to agree with your team beforehand what tags are being used. If you are using the API, the tags can also serve as filters on the front end. Keywords: The keyword search allows you to look for any word in a post. Channels: You can choose to see specific channels only. This is useful when you are editing moderated posts, for example, or are looking for social posts from a specific source like Facebook. You can also include polls in your coverage to further engage your audience. These polls can also be copied and pasted onto any other pages in your CMS to increase visibility. ScribbleLive’s manual scoreboard can be repurposed, using CSS to hide some sports-specific elements, to keep track of how many electoral votes each candidate has secured during the voting period. Know how to write a support ticket: We are aware that sometimes you need help within a matter of minutes, and we do our best to resolve issues as quickly as possible. However, to be successful and efficient, we need as much information from you as possible. Here is a link to our Knowledge Base with information on what to include in your support ticket. Consult the Knowledge Base: Support teams should concentrate on pressing technical issues. Therefore, if you have a product feature question, please first check our detailed knowledge base where you can find detailed guides on all features. Do not execute any load tests without letting us know: If you plan on running a load test in the days before or straight after Election Day, please email our support team immediately. In the past, we have seen the tremendous stress on our systems due to unknown load tests ran by our clients. We want to avoid any issues, especially during this significant news week. Therefore, if you plan on running a load test we highly recommend that you coordinate the test with ScribbleLive's Support Team. They will assist you to run the test in the most efficient way to avoid any unknowns for both parties. Choose the right login page: Please make sure to always login via client.scribblelive.com, not www.scribblelive.com – this ensures you always have access to the backend, even if our marketing website is down for maintenance. Subscribe to the ScribbleLive Status Page: All editors on duty should be subscribed to email notifications from the ScribbleLive Status page. If there's any downtime resulting from planned maintenance or unplanned server disruptions, this system will make you aware and keep you updated on the status progress.